What it is: The aim of this word puzzle game is to find all the hidden words. They can be vertical, horizontal, diagonal or backwards. Simply swipe your finger over a word to select it. What I love: My 12-year-old daughter loves this game! She’s the one who introduced me to it. This isn’t just a “find-the-word” game. The letters are jumbled and the only clues you have are a topic (e.g., “vanilla”) and how many letters are in the words they want you to find. I love that you can play this game offline, so if you don’t have access to wifi, it’s a great way to keep your kids busy in a waiting room or traffic via the app. 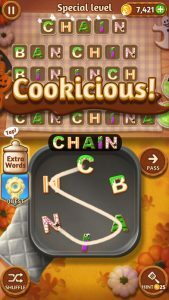 You can also earn coins by finding extra words beyond what they’re asking for. You can also earn daily rewards in the form of coins. What I’d change: I’d love it if you didn’t have to pay to get an “ad-free” version.